More or less the same day that Sulak Sivaraksa delivered his acceptance speech to receive the Niwano Peace Prize in Kyoto, Japan, the UN General Assembly adopted a unique resolution on happiness prepared by member state Bhutan. This historically significant parallel, rather than just a coincidence, challenges the world to ?re-think? development. in the spirit of the UN Millennium Development Goals. The resolution called on a ?balanced approach? to economic growth that can lead to sustainable development, poverty eradication, happiness and well-being of the planet. It also invited the world body to ?pursue the elaboration of additional measures that better capture the importance of the pursuit of happiness and well-being in development with a view to guiding public policies.? 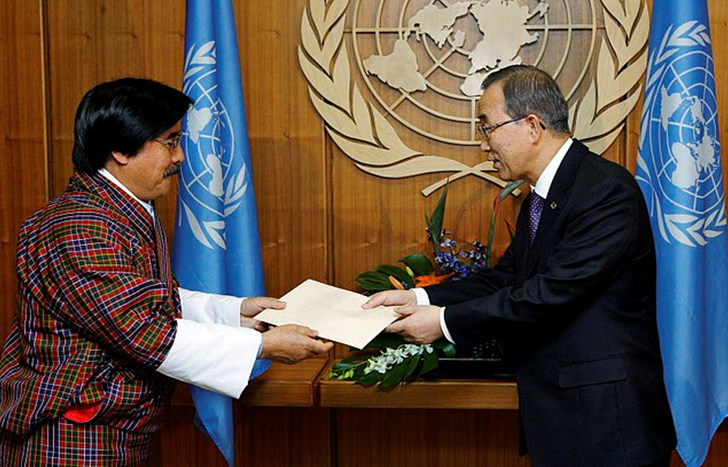 Lhatu Wangchuk, Bhutan?s ambassador to the UN, whose country was a co-sponsor of the resolution, said it was ?inspired by the belief that we need to begin discussing a topic whose moment has come, at the UN.? He said Bhutan has offered to convene a panel discussion on the theme of happiness and well-being at the next session of the General Assembly to be held in September. Prior to this discussion facilitated by Bhutan in September this year at the United Nations, Sulak Sivaraksa will speak at Chulalongkorn University, Bangkok, in the framework of an international exchange platform 25-27 August 2011, organized by the School for Wellbeing Studies and Research. The title of the platform is Re-thinking Property. Pathway to a Well-Being Society Scenario? Other resource persons will include Nicanor Perlas (Right Livelihood Award recipient, Philippines), Dasho Karma Ura (President Centre for Bhutan Studies), Ramaswami Sudarshan (UNDP), Ms Cheah Vannath (Cambodia), Sombath Somphone (Laos) and Takayoshi Kusago (professor of Social Systems Design, Kansai University, Japan). Earlier in August, a preparatory gathering will take place in Bhutan, organized by the Centre for Bhutan Studies, involving economist Jeffrey Sachs, UN Advisor on the Millennium Development Goals; Richard Layard, professor at the London School of Economics and author of the book Happiness: Messages from a New Science; and John Helliwell, expert in wellbeing studies from Canada. Among the participants the School for Wellbeing Studies and Research was invited to present its views. The Re-thinking Property exchange platform in Bangkok, later in August, will bring Asian scholars, activists and business leaders together, in a global context. The aim is to explore options for ?alternative development? in light of the Bhutanese call to re-new attention for the universal pursuit of happiness. A leading thought behind this Bangkok experimental contribution to the global dialogue on happiness and wellbeing policies ? a shift from the present unqualified economic bias ? is, as tentatively formulated: distinct dimensions of happiness may resonate with archetypical attitudes constituting various property regimes. In order to realize a ?balanced approach? to economic growth that can lead to sustainable development, poverty eradication and wellbeing for the planet, as promoted in the Bhutanese resolution, we have to re-think the legal as well as cultural foundations of property regimes. The world is confronted with challenges in various fields. Among them the call of U.K. opposition leader Ed Milliband to re-think property regimes in the media-world, the raise of peer-to-peer networks in fields of Information Communication Technologies (ICT) and social networking as new space for civil society action. Regarding land property an international coalition against ?land-grabbing? was formed during the World Social Forum 2011 in Dakar. An interesting case is that a regulation is in the making which would entitle the government of Thailand to hold all intellectual property rights on seeds: not really the answer local seed breeders and farmers may expect to effectively counter the dominance of multi-national seed corporations. The neo-liberal world view emphasizes and promotes a private property regime, favouring not only individuals, but also corporations that are attributed the same rights as ?free? individuals. While in communism or socialism public property (ownership by the state) is placed central to uphold its model of the ?welfare state?. The global movement towards an alternative development-path in contrast is recognizing more and more the centrality of common property. A key presentation during the Bangkok exchange platform on Re-thinking Property will be made by Silke Helfrich of the Commons Strategy Group, a global network of ?commons? activists. The three perceived dimensions of happiness corresponding with these particular property regimes are: satisfaction of needs corresponding with private property; contentment and detachment from outer conditions with state or collective ownership; and happiness generated by fulfillment of meaning, altruism, corresponding with common property. None of the three property regimes can stand alone. However, in the present world-economy private property and public property regimes have merged into one inter-locked system of ?state-capitalism? (China) and ?capitalism supported by the state? (USA) that denies enough space for emerging civil society networks based on common property principles. A ?balanced approach to economic growth? requires that this space, enabling a civil society driven economy, should be reclaimed and re-created, in order to keep private property and public property regimes in check. Pushing them back within the boundaries of where they are meaningful and supporting sustainable development, poverty eradication and wellbeing of the planet. Within this ?action-research platform? a re-newed role for Buddhist Economics is emerging. During the Re-thinking Property event in Bangkok Prof. Hisashi Nakamura (Japan) and Prof. Apichai Puntasen (Thailand) will open the debate on the contribution of Buddhist philosophy towards re-thinking world economy. Ultimately they will facilitate the dialogue on Buddhist Economics during the, what is expected to become, groundbreaking INEB conference From Personal Awakening to Global Transformation in Bodhgaya, October 2011. Forty years ago, in the late 60s and early 70s of the 20st century, wisdom leaders anticipated the problems that are surrounding us everywhere now. And they also pointed to solutions: E.F. Schumacher, inspired by the economy of Burma, wrote his book Small is Beautiful. Economics As If People Matter. Sulak Sivaraksa established the Sathirakoses Nagapradipa Foundation already in 1968. The Club of Rome published its Limits to Growth. In France the International Federation of Organic Movements (IFOAM) was formed. And the King of Bhutan conceptualized Gross National Happiness. Hopefully, the coming decade will become the decade of personal awakening leading to global transformation. We have to join hands now to make happen what was foreseen as needed and possible by our wisdom leaders 50 years ago. In Buddhist terms: from Enlightenment to Maha Puja.